"Granular-great from the beginning...and getting better!" As a 3 year veteran user of Granular, I have seen what I thought was a good program from the beginning only get better over the years. It is amazing how far it has come in the time I have been using it, and I know it will just continue to improve in the future. There is so much information in Granular that sometimes it is hard to surface what you need at a glance...but they are working on that! During a G-School training they focused breakout sessions on how users would like to see information quickly and easily in the program. I have complete inventory tracking available at my fingertips. I can look up crop or input inventory from anywhere! "Great FMS, Great Support Team, and a Huge Value to Our Operation." User friendly software program and mobile app. The support team is always there when you need them. They are growing and updating to grower needs. We wish they could have an accounting side, so we don't have to do double-entry. Also, if they could have something in place to reconcile inputs like other FMS, that would help. It save lots of time, and should improve your operation once things get going. It may take a while to get use to at first especially with the older crowd. I would advise having a sole administrator for the app, as it takes a person on our team to audit the information coming in as well as making sure things are getting entered. We know our costs per acre, and can look at the analytics much faster than using older systems. No more spreadsheets galore strung across the networks that people may forget where they stored them too. We have made some rental decisions based on our information collected, as well as noticing where our true breakeven point is for doing better marketing. "Granular helped take our operation to the next level. We are a more efficient operation as a whole." Granular provides a program that allows us to have all the information/data we need in one platform. From inputs used, to inventory, to contract we have it all at our fingertips. They listen to their customers and continue to adapt and change as the industry changes. A lot of double entry within the financial piece. Entering in granular and accounting software. Would some way to import. Reporting has been huge for us. We pride ourselves in being transparent with land owners. This allows us to track more detail to each individual field. We are able to analyze at a higher level allowing us to feel more confident when picking up new farms or doing research plots. At the end of the day we want to see a return on each individual field. This has given us the tools to create field history and tack profitability. "Best ERP system for production ag"
Granular's team is very much a partner in that they solicit feedback and involve the customer in the continued development/improvement of the system. We view the Granular team and software as an integral part of our operation to provide the data we need to make more timely and improved management decisions. Currently in third year of use as an ERP system for production ag. Granular helps provide timely and accurate data covering operations and allows for improved management decisions with improved insight into product and labor usage, scheduling, and financials. Granular has provided a more efficient means of communication and task tracking from an operations while aggregating and providing detailed metrics and financial info down to the field level. "Very informational and positive training." Enjoyed the producer panel where real-world do's and don'ts were discussed. This drove discussion from the other producers in the room that may not have had the same experience as the producers on the panel. Thought this discussion generated great ideas and best/alternative practices. We didn't into the future roadmap as much as I thought. There were slides and some discussion, but generally the discussion was brief. I understand why it was this way as we had a lot of content to get through in a short amount of time - and also as there was a variety of experience levels there in terms of using the Granular product. You will get out of the product what you put in. ERP system for managing our farming segment. As far as benefits, we have eliminated paper binders in the equipment that held our field plans. We can also add acres to our farm with no significant issues in farm management. We believe we can scale our farm using this product. 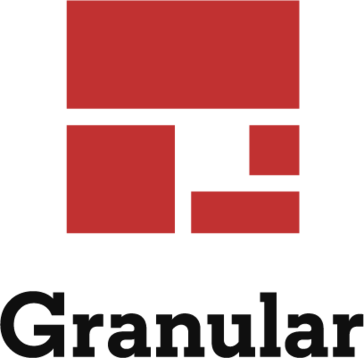 "Granular - a new users perspective"
This was my first in depth introduction to Granular. G School was create to get a better understanding of the big picture, full capabilities, and to see what is coming soon. In my experience at G School, I did not have any dislikes. I am particularly interested in utilizing work orders to dispatch trucks, as well as getting more in depth with the financial analysis tools. "Taking organization to the next level"
Data captured in Granular brings a higher level of detail from which I can make better informed decisions. It takes dedication to the system and all of its data demands in order to get the management value back out. I found through the process that the higher level of detail the data drives is what I needed to get to the next level of competitive decision making. Profitability on a farm by farm basis. Harvest inventory records and elevator audits. Granular brings all our farm data from our multiple programs into one place. The staff and support with the company is fantastic. They are always willing to help and make sure the program is working right for us. They also listen to suggestions that will help us and implement them. Setting up each year does take a lot of time, however it is much faster than the excel spreadsheets we use to use to keep track of everything. Tracking seed, fertilizer, chemical, and implement usage. Granular puts all this information into one place. Our main benefit is we have decreased if not eliminated our use of multiple spreadsheets to keep track of all our farm data. It also keeps track of financials for the farms and provides many useful reports. I like the ease of use. Everything is laid out perfectly and all the tools that you would need to use are accessible. I store sales information and contacts and can easily find all my information. I dislike how some things are saved to my computer automatically. I am tracking information and making sales with other rehab businesses. there is so much data to put together and track, we have it all here. * We monitor all Granular reviews to prevent fraudulent reviews and keep review quality high. We do not post reviews by company employees or direct competitors. Validated reviews require the user to submit a screenshot of the product containing their user ID, in order to verify a user is an actual user of the product. Hi there! Are you looking to implement a solution like Granular?